Heat 1tbsp oil in a large saucepan with a lid. Season beef and cook over a high heat for 10mins until browned. Set aside. Add a splash of water and scrape pan to remove bits. Add 1 tbsp oil. Turn the heat down, fry the onion and garlic until softened. Return meat to the pan, add flour and stir for 1 min. Add syrup, cumin, tomatoes and stock. Bring to boil, reduce heat, then cover and simmer for 2hrs. Stir occasionally and check that the meat is covered with liquid. Add peppers and chickpeas and cook for a further 15mins. 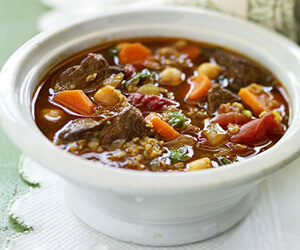 The stew can now be cooled and kept in the fridge for 2 days or frozen. Serve with coriander in bowls, with cous cous or rice and salad. Gallery | This entry was posted in Recipes / Food and tagged Beef, Beef & Chickpea Stew, Chickpea, Food, Recipe, stew, Tomato, WINTER. Bookmark the permalink.